After you have created an initial list of all your potential Kickstarter campaign backers, you need to figure out a way to get in touch with all of them. Obviously, you will likely talk one-on-one about your project to your most personal contacts, such as family or close friends. However, there will be a large list of people that need different ways of contact. Each person’s individual e-mail address. Ensure that these people will recognize an e-mail from you on name alone — meaning that they know you as a person and not just an e-mail list administrator. A concise and direct call to action announcing the program and your request for backing. 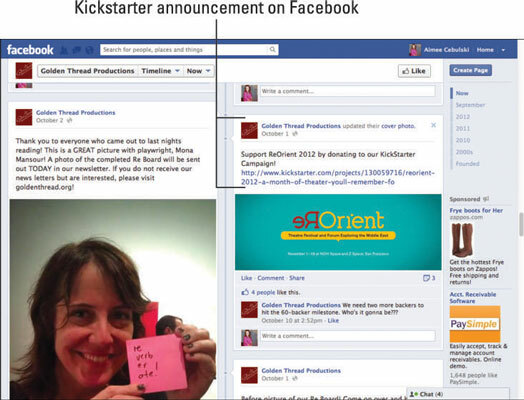 Facebook is useful for sharing news and updates about your projects, and that includes promoting your Kickstarter campaign. It’s important to do regular updates that relate to both your requests for support and your generic project updates. A quick blurb with a link to the Kickstarter page is a way to keep your project top-of-mind for your Facebook network without having to ask directly every single time. It’s important to remember that your Kickstarter campaign is only a small part of your overall Facebook community; make sure you don’t turn your Facebook wall into a never-ending sea of posts about your campaign. Beyond having a personal Facebook profile, you also have the option of creating a business page that can be used to promote your project. Similar to a personal page, you can post updates, photos, links, videos, and more. Based on the nature of your project, select the appropriate category and begin developing your page. 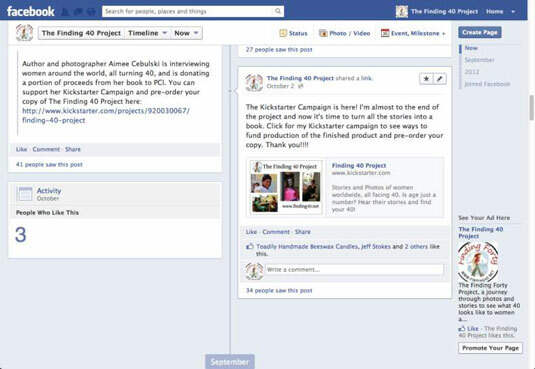 A project-specific Facebook page is an excellent additional resource for promoting your Kickstarter campaign. Begin building your Facebook page before starting your Kickstarter campaign to give you another opportunity for promotion from the day you launch. On your main campaign home page, a button on the far right provides a link to your personal Facebook profile. Kickstarter has its own business page where you can keep updated on the latest projects and modifications to the Kickstarter page. Click the Like button to add this page to your Facebook News Feed. If you end up creating a business page for your project, you can link to that page in your long description by adding the full website address in the copy and clicking the Link button in the editing box. Although Twitter gives you only 140 characters, you should be able to compel your followers to at least click through to your Kickstarter campaign link to learn more about your project. Keep the content relevant to your campaign. Use some or part of your Call to Action. Include a short URL that directs people to your Kickstarter campaign. Using a short URL enables you to include a link to your tweet without using up your entire 140-character allotment. You’ve already created a strong project video, so here’s another way to use it to your advantage. Since the project video is designed to explain your project in a nutshell, use it to tell your story on other video-sharing sites. Make your video public. You want your video to turn up in search results, and you want viewers to have the ability to share the video with their friends. Add search tags that are associated with the keywords in your description. Examples include film, photography, and so on. Make sure one of these is a keyword relating to the topic of your project. Include your name. You want to make sure to develop recognition as the project creator and enable people to find your project via your name if they know you or know of you. Insert your Kickstarter campaign URL as a clickable link. 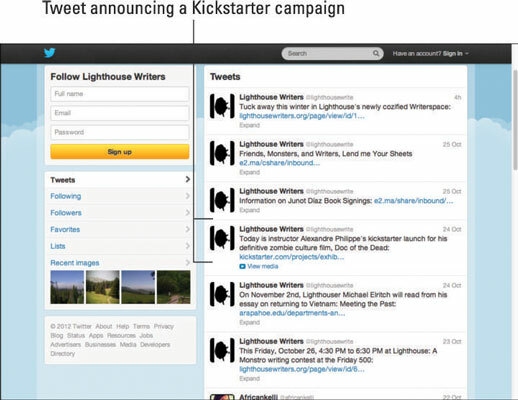 Using your short blurb, keywords, and Kickstarter URL allows users to find you if they search for any of those topics.